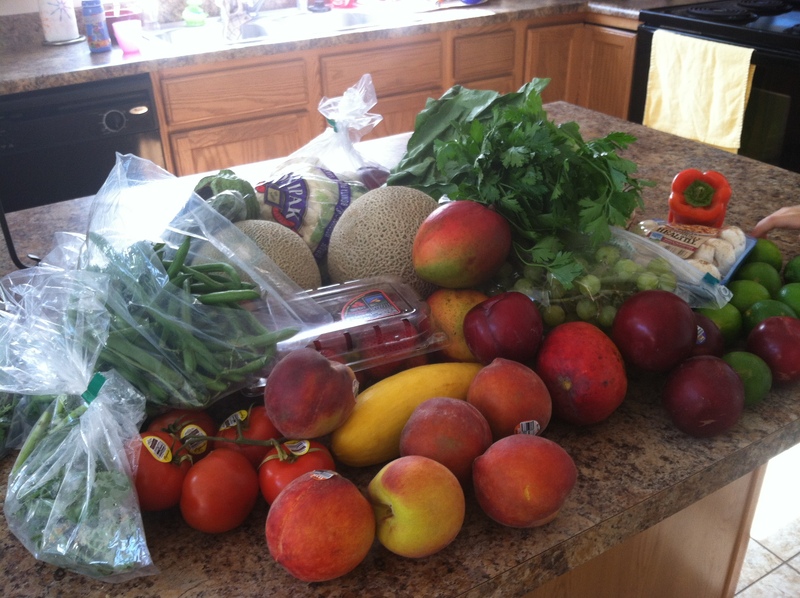 Posted on July 8, 2012 by Becki M.
A little over a year ago I heard of a produce food coop called Bountiful Baskets. Basically, you sign up, contribute $15, and then pick up your basket of goodies on Saturday at the location of your choice. Now, we go through produce in this house like crazy; my kids get fruits and veggies at every meal, and that is a lot of food! However, it took me a year to finally do it. Something about it seemed intimidating to me until I saw one of my friends do it. I’m rarely the first one to try something; I usually hang back and see how it goes before I dive in. So, I’ll show you the lay of the land in case YOU want to try it as well! First, go the Bountiful Baskets website. They have a very informative page that will answer all of the questions you have. I will write about my experience which may answer some of those questions as well. So, this is how it went down for me. On Sunday, I set up my account. Very easy to do. On Monday at NOON (check on what time your state opens), I went to the BB site to put in my order. I clicked on “Get my Produce Basket”, clicked on my state, county, and site location that I wanted to pick up from (there was one about 5 minutes from my house…SCORE!). It takes you to your order page. You can choose between a conventional basket ($15) or organic ($25), both have 50% veggies and 50% fruit. You do NOT get to choose what is in your basket; it is whatever is in season and whatever the farmers markets have in stock for the coop to purchase from. Every week they have add-ons, which you can choose for an additional cost. This week I got a Veggie Lovers pack in Italian Theme for an additional $8. Next week I’m going to order bread…5 organic loaves for $12. Some weeks they have special add-ons…this week was a case of cherries, but I didn’t get it because they were sold out by the time I ordered. So, I put in my order and had to patiently wait until this morning. I won’t do the additional veggie add on every week, but I wanted the fresh herbs. I got a huge amount of them…the basil alone I got would have cost me $10 in the grocery store! And the quality is superb! Today I made a Strawberry Mango salsa from the basket and they were the best strawberries and mangoes I’ve ever had! Delicious! 1. Make sure to go to the website and order your basket as close as you can to the open time. Some sites fill up very quickly! 2. Make sure to check your produce before you leave; there are no returns or refunds! 3. Yes, you may get things in your basket that you are unfamiliar with. That’s the fun! I’ve never cooked eggplant before, but a quick internet search found a recipe that I can’t wait to try! Not quite sure what to do with the cauliflower though, lol! I can’t wait to do it again next week!